The extended demolition of the South Gate area between 1962 and 1977 marked one of the most destructive phases in Exeter's 20th century history. Hardly a single bomb was dropped here during World War II and it largely escaped the catastrophic slum clearances of the pre-war years. 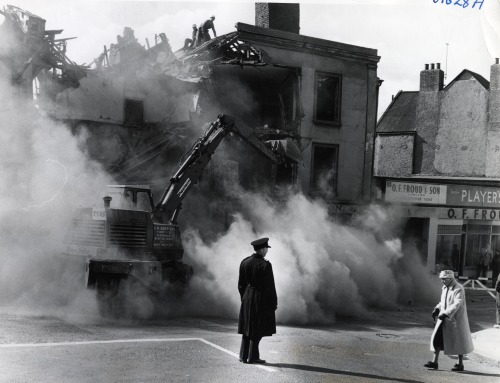 The photograph left shows late Regency houses being demolished in Magdalen Street in 1964 © Express & Echo. At South Gate the destruction of nearly all the historical structures in the area was a result of the inner bypass, a post-war ring road that now carves its way from the top of Sidwell Street, past South Gate, through the West Quarter and on towards Cowick Street and Alphington Street on the opposite side of the river. The scale of the destruction was immense as literally hundreds of pre-war townhouses, shops, courtyards, tenements, gardens and warehouses were bulldozed out of existence and replaced with what is now a multi-lane carriageway. 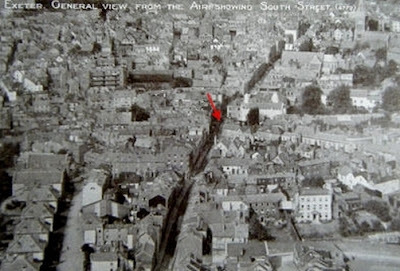 The clearance at South Gate alone involved the removal of much of Magdalen Street, most of Holloway Street, the whole of Quay Lane, a few surviving buildings at the bottom of South Street, and a large section of Exeter's city wall that had stood since the end of the second century AD. The Edwardian Exe Bridge, Alphington Street and Cowick Street fared little better. What made the destruction at South Gate particularly unfortunate was its historical importance to the development of the city and the architectural significance of some of its buildings. Following the Exeter Blitz of 1942 it remained one of the Exeter's last intact historical cityscapes and a large number of the buildings dated to the 17th, 18th and early 19th centuries. The photograph above shows the view into Magdalen Street from the bottom of South Street in 1960 © Express & Echo. Nearly all of the houses shown dated from between c1659 and c1720, some with later mid 19th century facades. The photograph below shows the same view today. As with almost everywhere in Exeter, South Gate has a very long recorded history. Sometimes shortened simply to Southgate, the area was the name given to the junction of South Street, Holloway Street and Magdalen Street where they met outside the great South Gate, itself demolished in 1819. The earliest artifact ever found in the city was recovered at Magdalen Street: a 250,000 year-old flint hand axe. 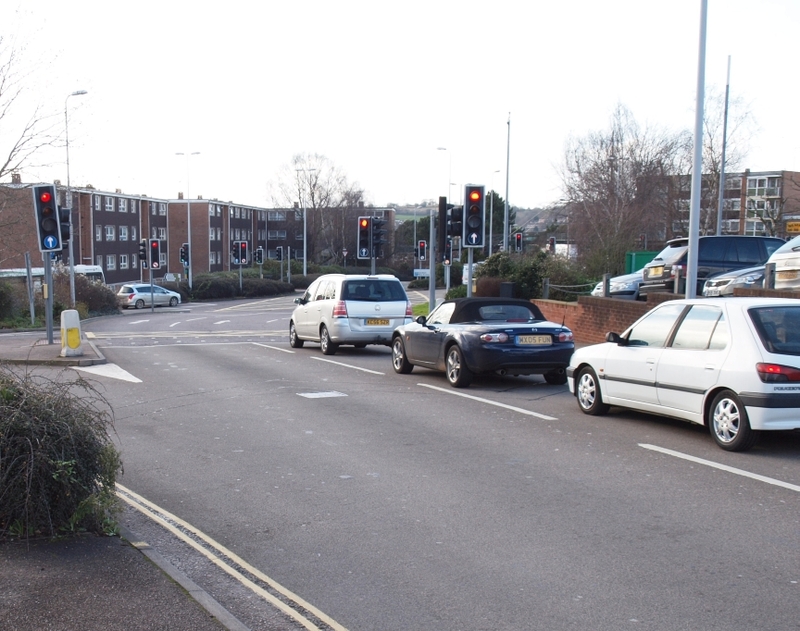 The top of Holloway Street was the site of a Roman legionary cremation cemetery in the 1st centry AD and the Roman road between Topsham and Exeter terminated here. Now a small, picturesque town some four miles from Exeter, Topsham was the Second Augustan Legion's supply base. This route still exists, divided into Topsham Road and Holloway Street. Used by thousands of people every day, it runs in a characteristically straight line between Exeter and Topsham. Magdalen Street, another road that ended at the South Gate, may also be Roman in origin. The main Roman route from Exeter to Dorchester is known to have run through Heavitree, about a mile outside Exeter. This road probably led originally to the Roman city's East Gate but it's likely that it forked before reaching the city walls with a spur running along Magdalen Road, Magdalen Street and into Exeter at the South Gate. The fork in the road is still present where Heavitree Road splits at what is now Livery Dole. The image above attempts to show how the Roman roads converged on Exeter in the 3rd century AD. The perimeter of the Roman city walls is highlighted in red. The Exeter-Topsham service road used by the Second Augustan Legion cAD60 is highlighted in orange. 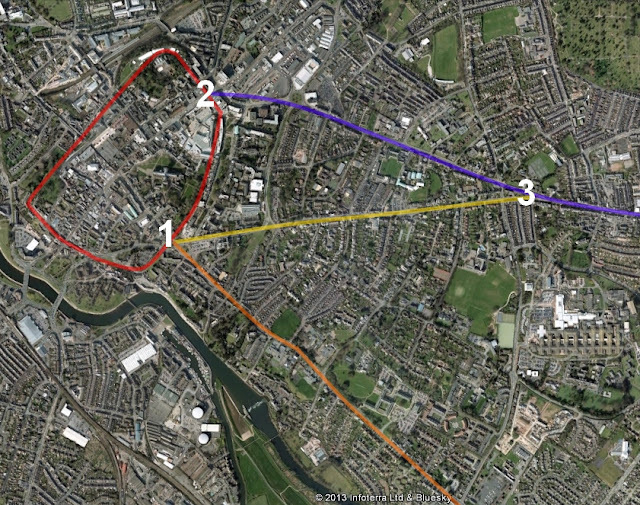 The main Roman road from Exeter to Dorchester, ending at the East Gate (2), is highlighted in purple. The spur that forked at what is now Livery Dole (3), which comprised Magdalen Road and Magdalen Street, and which terminated at the South Gate (1) is highlighted in yellow. Except where it was destroyed outside the South Gate in the 1960s and 1970s, and where Paris Street was rerouted following post-war reconstruction, the road plan has remained essentially unchanged. 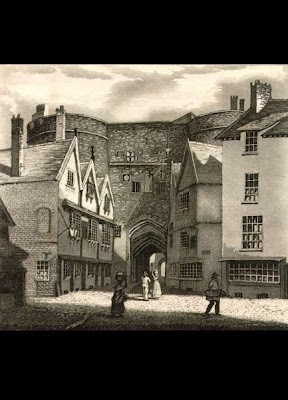 The image left shows the exterior of the South Gate from Holloway Street in the early 19th century. Magdalen Street runs off to the right. Although the gatehouse was demolished in 1819 the three 17th century timber-framed buildings to the left survived until they were demolished in the 1960s. The narrow entrance into Quay Lane was down the side of the nearest of the three houses. Another ancient route that led into the area outside the South Gate was Quay Lane, used for hundreds of years to bring goods up into the city from the Quay. Built over the city's in-filled defensive ditch, Quay Lane was lined with small houses that backed onto the city wall, the variety and charm of its townscape the product of centuries of gradual evolution. 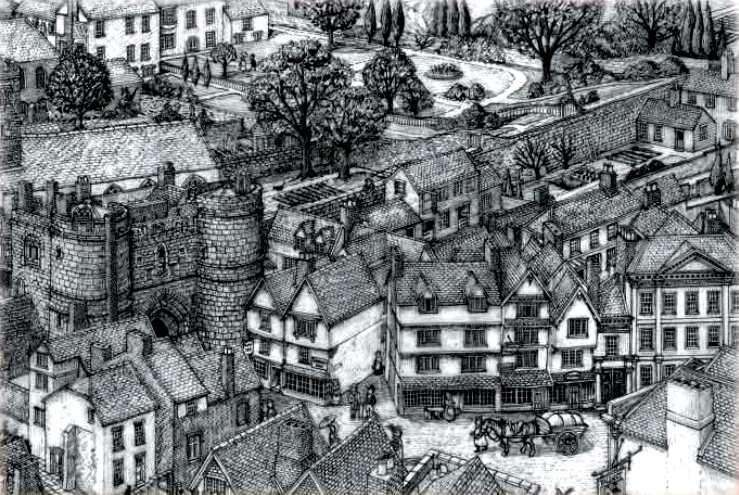 In c1300 the Greyfriars of Exeter moved their friary from its site at Bartholomew Street inside the city to a large area outside the city walls just south of Holloway Street. Dissolved during the Reformation, some of the friary buildings survived until they were demolished during the English Civil War. The houses on Quay Lane were built within the precinct of the old friary and two roads south of Holloway Street are still known today as Friars Walk and Friars Gate. The South Gate itself formed one of the main entrances in and out of Exeter. In 1452 Henry VI began a Royal Progress that reached Exeter on 17 July. Accompanied by 300 dignitaries from the city, he was met at Livery Dole by the monks from the city's Greyfriars' priory and Dominican friary. The king and his entourage then processed along Magdalen Road, Magdalen Street and into the city at the monumental South Gate which had been adorned especially for the occasion. Braun and Hogenberg's 1587 map of Exeter above right shows that a small medieval suburb had built up outside the South Gate in Magdalen Street and Holloway Street. Nicholas Smith's mansion of Larkbeare is shown as is Quay Lane and what are probably some of the remaining buildings of the Franciscan friary in the field at the bottom. In the autumn of 1645, during the English Civil War, the city's Royalist defenders deliberately razed around 80 houses on the south side of Exeter to clear the ground outside the South Gate and to have an improved field of view for cannon and muskets. Most of the houses outside the city walls in the South Gate area, including many in Magdalen Street and Holloway Street, were affected. 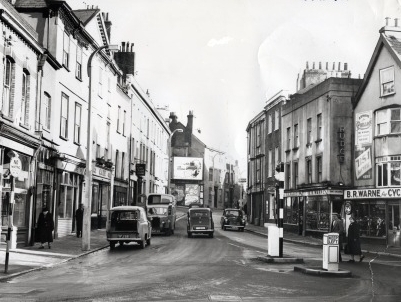 In his book, 'Two Thousand Years in Exeter', published in 1960 before the 20th century demolition of the area began, Hoskins wrote that "there are a number of gabled houses of late seventeenth-century date in Magdalen Street and Holloway Street. These houses are those that were built again after the war was over to replace those that had been destroyed." 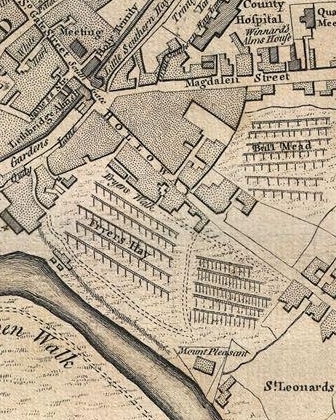 Benjamin Donn's 1765 map of the city left clearly shows Magdalen Street, Holloway Street and Quay Lane as they converge at the South Gate. It also shows that by the mid 18th century the area had recovered from the damage inflicted during the English Civil War. The evocative drawing below © Exeter City Council by Richard Parker appears on an information panel associated with the site of the South Gate. The drawing shows the junction of South Street, Magdalen Street and Holloway Street c1800. Magdalen House, with a classical pediment at roof level, can be seen on the far right. Exeter historian Jacqueline Warren left a vivid description of one small part of Magdalen Street prior to its demolition: "Another of these Jacobean houses had a cobbled passage to a court from which a flight of stone steps led to the front doors of two dwellings. This was Bowden's Place, and in its happy, simple design, it had incredible charm. Beyond the first court, and past a fine, early nineteenth century iron gate was another little courtyard where a hefty sandstone buttress held the lower portion of a slate-hung house. The narrow cob-wall passage of one of the houses led to an alley from which could be seen the slightly sagging ridges of original slate roofs. Eventually, through this enchanting maze, one coud reach Holloway Street". Following the pre-war slum clearances, the bomb damage of 1942 and the destructive post-war reconstruction, the post-English Civil War houses around Southgate were some of the oldest domestic buildings still standing in Exeter outside of the Cathedral Close. The image left shows the 1905 Ordnance Survey map of Exeter overlaid onto an aerial view of the same area today with the following numbering: 1 Site of the South Gate, 2 Quay Lane, 3 Magdalen House, 4 42-46 Magdalen Street, 5 The Valiant Solider Inn, 6 Magdalen Street, 7 Holloway Street, 8 Nos. 71-73 Holloway Street, 9 Site of Franciscan Friary. The route of the city wall is highlighted in purple. 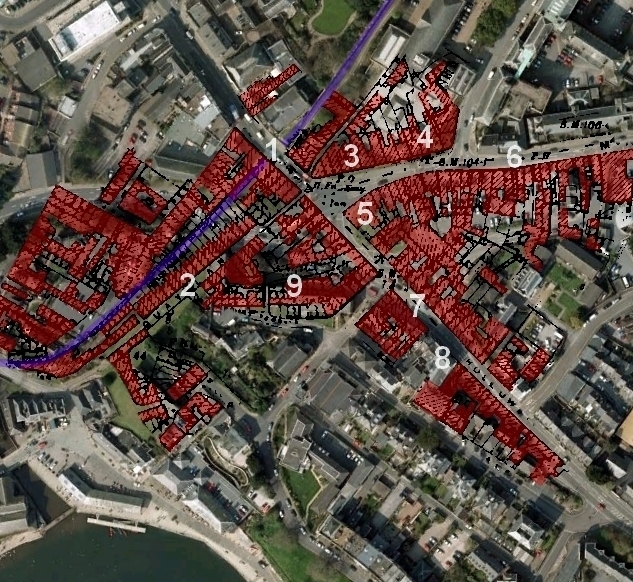 The buildings destroyed as a direct consequence of the inner bypass, well over 200 in total, are highlighted in red. Quay Lane was completely demolished, even though the bypass ran nowhere near it, as was most of Magdalen Street. Holloway Street was similarly decimated. The pre-war aerial view right shows Holloway Street in the foreground running up to the former site of the South Gate (marked with a red arrow) and merging almost without a break into South Street. It shows how densely built-up the area was at the beginning of the 20th century. The majority of the buildings north of the red arrow were destroyed in pre-war slum clearances or during World War Two. The majority of the buildings south of the red arrow were destroyed during the creation of the inner bypass. The inner bypass was initiated as early as 1949. It was designed to intercept heavy traffic arriving at Exeter from the east and bypass it across the river. In 1950 work began on surveying the proposed route between the top of Sidwell Street and Exe Bridge. Construction didn't commence at Belmont Park near Sidwell Street until 1953 and by 1960 the bypass had reached as far as Magdalen Bridge. 1962 saw the demolition of the Valiant Soldier inn and work started on continuing the bypass from Holloway Street to Exe Bridge. By 1965 the bypass was complete but work continued on creating a gyratory road system near to the old West of England Eye Infirmary. The last demolitions didn't take place at South Gate until 1977 by which time the road system achieved its present form. The photograph above shows the view across the junction of Magdalen Street and Holloway Street in the 1940s. 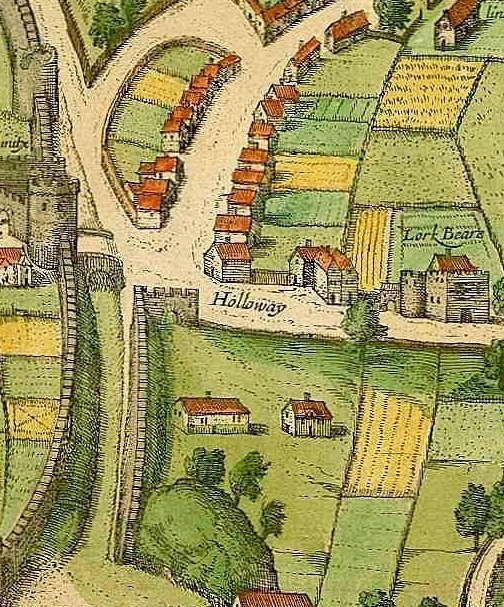 The three gabled houses to the right from c1680 are the same ones visible in the early 19th century depiction of the South Gate but with slightly altered facades. The very narrorw entrance into Quay Lane was to the left of the left-hand house. In his book 'Conservation Today', published in 1989, David Pearce discusses the implementation of so-called Dangerous Structures Notices used by English city councils in the 1960s and 1970s to get rid of inconveniently sited old buildings: "Council-owned, council-neglected then council-condemned was all too frequently the fate of listed structures impeding redevelopment". The idea was that the local authority would purchase a building, willfully neglect it and then issue a DNS on the structure when it was deemed either structurally unsafe or unfit for habitation. As Pearce says, "Exeter swept away splendid seventeenth century merchants' houses as if vying with Bristol to disfigure itself". The photograph below © Express & Echo shows Magdalen Street in the early 1960s when demolition had started in Holloway Street (in the background). The Valiant Soldier inn had already been bulldozed. The photograph above shows Nos. 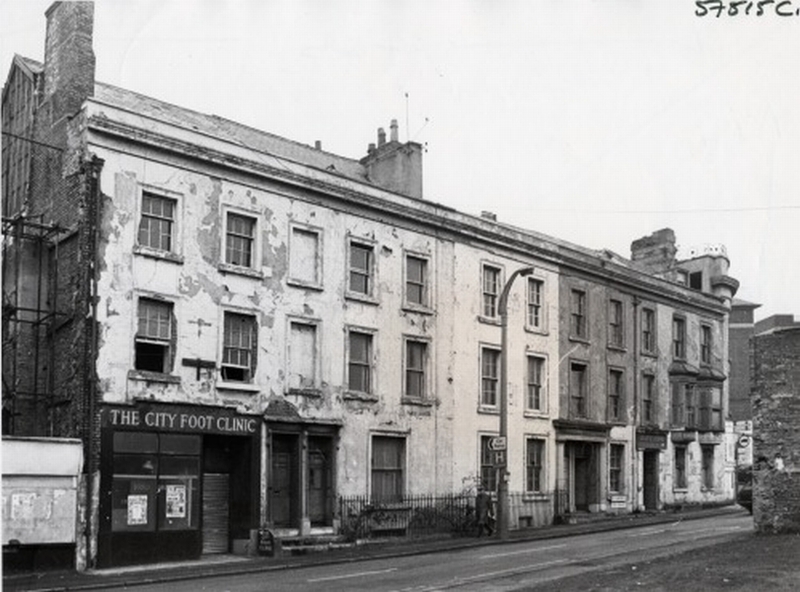 42-46 Magdalen Street in 1975. Purchased by the city council they were allowed to rot before being demolished. The late Georgian facade of Nos. 44-46 concealed the mid 17th century brick mansion of John Matthew, a fact that was only discovered when the property was being demolished. The specific buildings mentioned by David Pearce were Magdalen House and Nos. 42-46 Magdalen Street, all of which were Grade II listed structures. (Magdalen House was listed in 1953. Nos. 42-46 Magdalen Street were listed in 1974. They were all demolished just three years later.) It is shocking to realise that these particular buildings, on the north side of Magdalen Street, did not impede in any way the new road system. The current pavement is on the same alignment as it was before the creation of the inner bypass and where the houses once stood is just a big patch of grass in front of the modern Southgate hotel. As Jacqueline Warren states, after 1974 Magdalen House "seemed safe, and it has never really been made clear why it was not properly looked after; why it was demolished instead of restored". Other important buildings suffered the same fate. No. 36 Holloway Street, known as Holloway House, was granted Grade II listed status in 1953. It was a large brick townhouse built at the end of the 17th century, its three-storey facade set back from the road. It was demolished in 1980. No. 35 Holloway Street dated to 1797 and was listed in 1973. It too was demolished. Nos. 48-56 Holloway Street were also Grade II listed in 1973. These were mid-19th century houses with stucco facades and an unusual string course and cornice that curved up the face of the houses following the slope on which the houses were built. These too were demolished. The west side of Holloway Street was almost completely obliterated. Nearly 400 metres of pre-war frontages were torn down leaving just three, traffic-blighted examples near the top to indicate what has been lost. (The three survivors on the west side are Nos. 71-73 Holloway Street, all Grade II listed, shown above and as 8 on the Ordnance Survey aerial view.) The east side fared little better with 'only' around 200 metres of pre-war frontages being demolished. Not only were most of the affected buildings in Holloway Street and Magdalen Street destroyed without any archaeological or architectural record, but a 30 metre stretch of the Roman city wall was hacked down to ground level by council workmen using pickaxes. As a Scheduled Ancient Monument the city wall was allegedly protected by law but the council applied to the Ministry of Works for permission to demolish it and permission was granted (another large section was destroyed at Eastgate during the post-war reconstruction). The houses in Quay Lane, another area that had little to do with the creation of the inner bypass, were also destroyed. 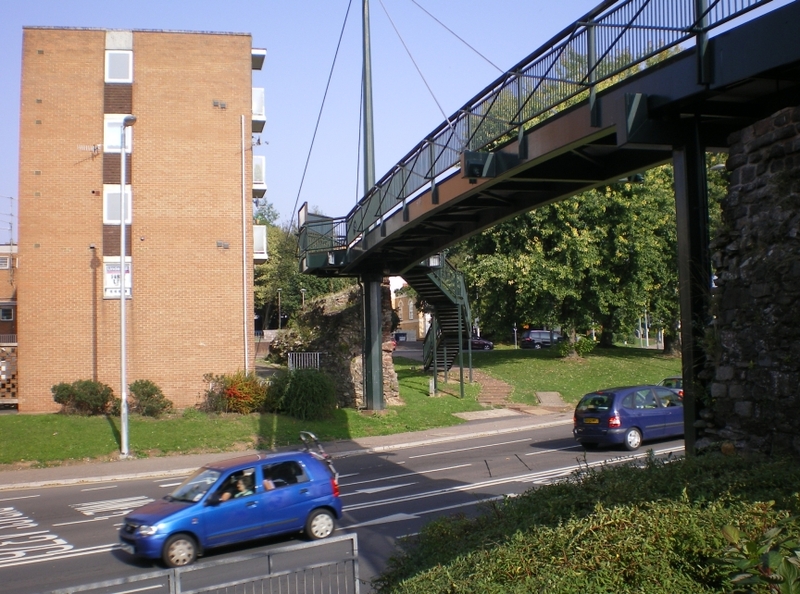 The photograph above shows the large section of the city wall that was demolished to accomodate the inner bypass, now spanned by a pedestrian footbridge. 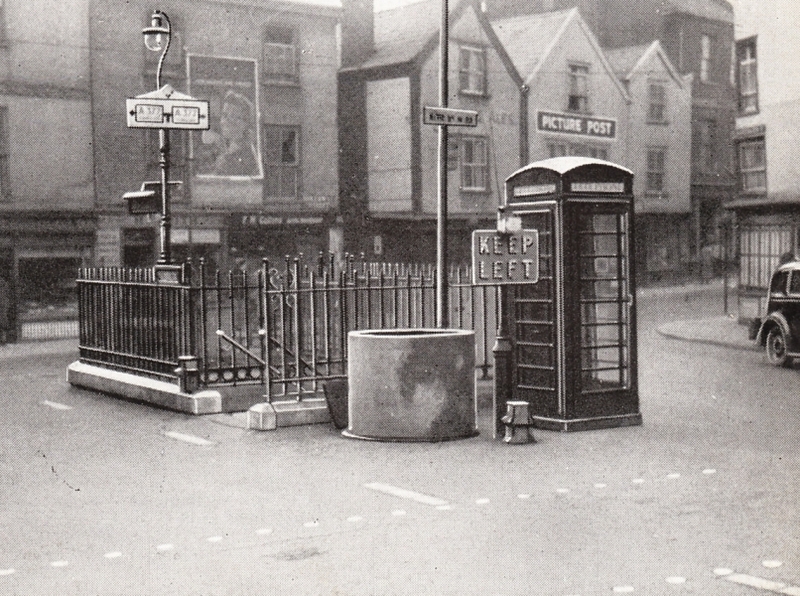 The photograph below shows the view towards the Magdalen Street-Holloway Street junction today. 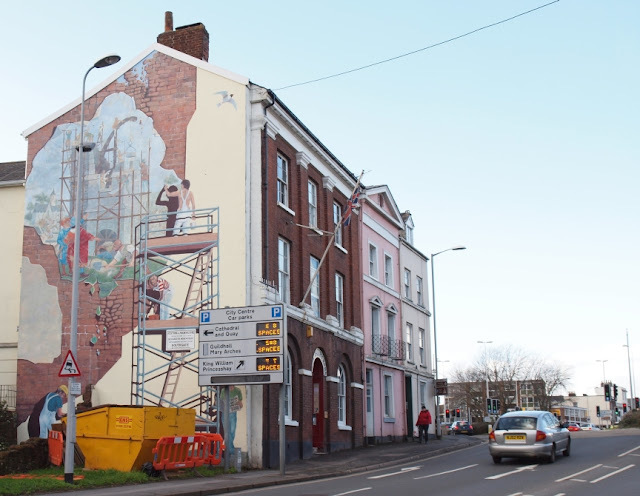 Changes in legislation during the 1980s made it more difficult for local authorities to destroy listed buildings but, for Exeter at least, it was too late as the obliteration of most of the city's historical fabric was complete. The pre-war slum clearances in Paul Street, Frog Street, Smythen Street, Preston Street and Stepcote Hill, the bombing in 1942 of the High Street, South Street, Bedford Circus and Sidwell Street, the post-war removal of most of the standing structures in the bomb-affected areas, the creation of the post-war inner ring road, the installation of the flood defence system in the 1960s, the rebuilding of the Exe Bridges at Cowick Street and Exe Island, and the creation of the sprawling Guildhall Shopping Centre at North Street, Goldsmith Street and Waterbeer Street has resulted in the wholesale destruction of Exeter as a visually historic city. The loss of life caused by the Exeter Blitz shouldn't be forgotten but it seems strange that so much emphasis is placed on the physical damage wrought upon the city by German bombers in 1942 when the majority of the architectural losses over the course of the 20th century have been entirely self-inflicted. In the city's Royal Albert Memorial Museum is a display of medieval, Tudor and Jacobean metal door fittings that were salvaged from the ashes of buildings destroyed in 1942. These fittings are accompanied by an information panel that makes the bizarre assertion that "after so much destruction people were determined to look after the historic buildings that remained". There are of course instances of the post-war city council salvaging historical buildings e.g. the remaining fragment of old Larkbeare House further down Holloway Street, the much-publicised 'House That Moved' (moved to the edge of the inner bypass) or, more recently, the restoration of Cricklepit Mill, but the extent of the demolition that took place around Exeter following World War Two is quite at odds with the museum's bold claim. It was only exceptional conservation cases that were considered to be of any importance. Although the general background noise of lesser streets and perhaps lesser buildings provided context, coherence and visual proof of organic development over centuries it was, unfortunately, regarded as expendable. Two other issues deserve mention. 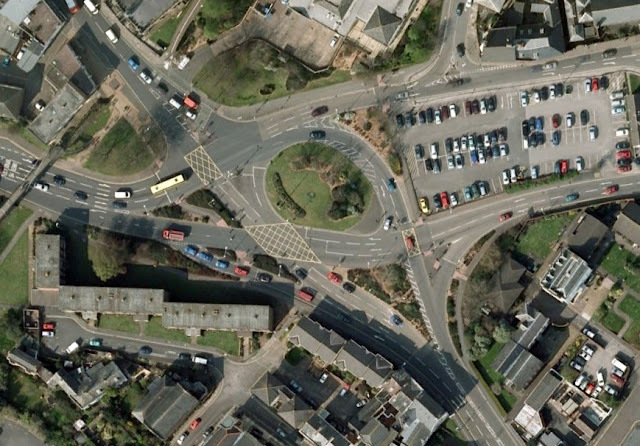 One is Exeter's over-burdened road system. The inner bypass was completed in the 1970s when both car ownership and the population of the city were much lower. 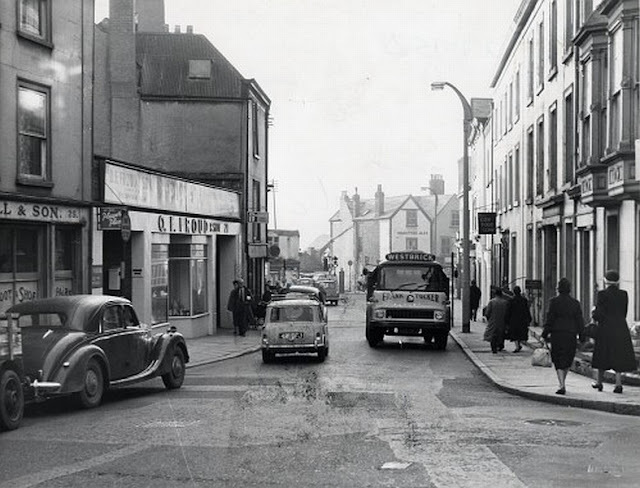 I'm sure it was lovely to speed around the semi-empty new road system in the early 1970s but anyone who has queued along Alphington Road, Topsham Road, Holloway Street, Western Way, Magdalen Street or Cowick Street will understand that the inner bypass now suffers from major gridlock at key times of the day. The situation will only become worse given the thousands of new houses that are being thrown up around the city's outskirts. It seems all that demolition only provided a temporary solution to what is becoming an increasingly big problem. The other issue is the poor architecture that was built in the South Gate area following the creation of the road system. These squat blocks of flats have no redeeming features other than their lack of verticality (although at least if you're in it you don't have to look at it.) Like so much of Exeter's post-war architecture, they wouldn't appear out of place on an industrial estate. What was once the great historical approach into the city is today a barren wasteland of roads, junctions, roundabouts and traffic lights. This is a wonderful blog. I have outdated software so keep getting failed results trying to prove I am not a robot, but will try with anon. I have many happy years in Exeter, and an interest in the Cathedral (of which I have Life Friend Membership). Especially your post on the Great East Window is of interest, not easy to get n image of. Interesting post, I cannot believe the amount of destruction in Exeter which was self-inflicted! Was there not any significant local opposition? Where was SPAB or SAVE when they were needed? Also the first picture is great, it's very evocative. Exeter is a perfect example of a city that has systematically destroyed almost everything that made it visually interesting or unique. It has, unfortunately, been nothing short of catastrophic. Looking for 1 Lakes Cottages, Quay Lane re ancestor in the 1940's. Found the article fascinating but shameful re 60's planning. Will be visiting area this April. There was a Lake's Cottages off Paul Street. There's a photo of it on the blog before it was demolished for slum clearances. Astounding site! Thank you for documenting so thoroughly and with such intelligence -- and with such images! -- the casual destruction of a city's heritage. I am researching my family history which centered around Quay Lane in Exeter. As a child I clearly recall the demolition of South Street from Fore Street. The reconstruction seemed appropriate at the time. The fact that these were perfectly serviceable and historical parts of our heritage is outrageous. The councils of the day no doubt were demanding modern approaches with vandals mentality. I wonder in hindsight how many were related to developers or benefited from the rebuilding and were hailed as "heroes" of the day. Maybe the blog could enlighten the rest of us who these paragons of virtue were and their standing for public recognition. MBE, OBE (Other B*****s efforts)CBEs etc were given for this blot on the landscape. As an aside I visited Dresden over 10 years ago the reconstruction there after actual bombing is amazing and has not interfered with the dynamic growth of the town. Shame on you Councillors who flattened a beautiful area of the town without any gain! The more that I learn about how Exeter used to be I am ever more horrified at how the City has been systematically destroyed as if by an enemy. Who has gained from this?